The winner of the “Elvis Presley Portrait Portrait Contest” on Fine Art America is Eric Dee of Broomfield, Colorado. The First Place portrait is titled “Elvis II”. Eric willingly and candidly participated in an interview with me following his win yesterday. Our interview regarding Elvis and art follows. Eric: Thanks Denise. I am quite surprised that I won! I feel others deserved to get many more votes. Denise: There were a lot of great pieces but yours is pretty incredible! A winner for sure! 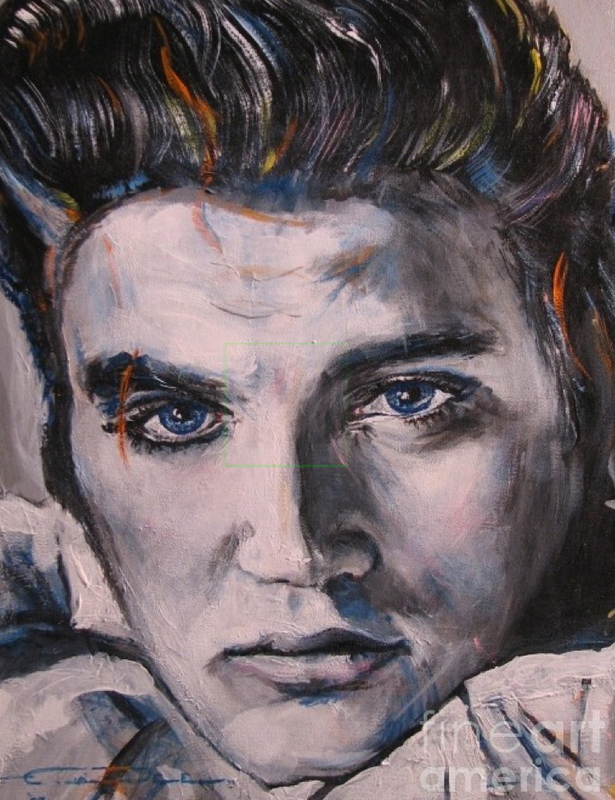 Describe your style and art medium on the “Winning Elvis Portrait”. Eric: I don’t know, Realism with a twist of swing / impressionism lite? I painted that piece on stretched canvas using acrylic paint and gin martinis. Denise: I agree, martinis can enhance the painting experience. I’ve never heard the expression “impressionism lite”. I like that! Creative! When did you first hear or see Elvis and what was your reaction to his public persona? Eric: I was in my Mother’s womb. I kicked because that was pretty much all I knew how to do. Of course the memories are a little vague. Denise: Doing some dance moves in embryo? Interesting. Did you ever see Elvis in person? Eric: No, and funny thing about that, to the best of my knowledge, he never met me either! Denise: Have you ever impersonated Elvis professionally, non-professionally, or just for fun? Eric: Yes. 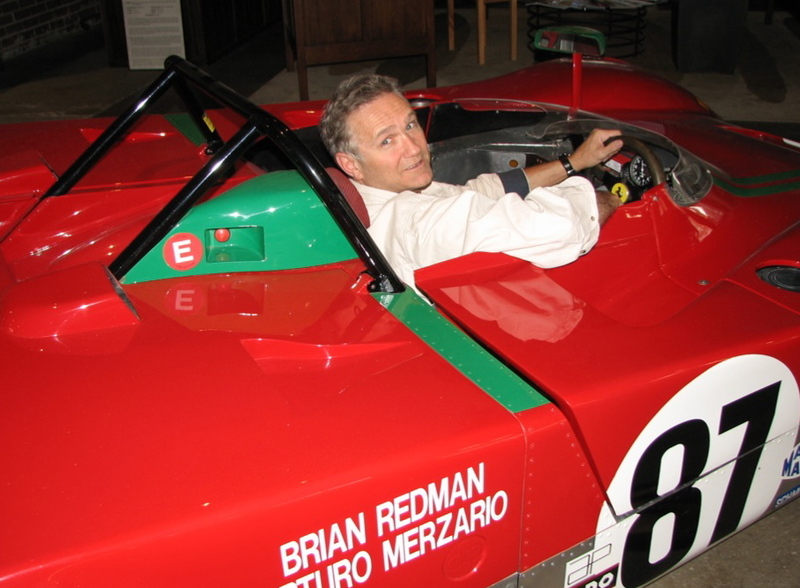 There’s that martini thing again. I do play some guitar/music and sing along with my brothers and a few friends and, well you know what happens to your leg when you’re doing ‘Blue Suede Shoes”..
Denise: When did you decide to create a portrait of Elvis? Is this “winner” your first Elvis portrait? How many Elvis portraits have you created? Eric: No the first Elvis I did for my Mother in oil and in color back in the late 70’s. Hence, my naming this one Elvis 2. So I guess that makes 4 total. No five. I did a fat Elvis for a friend that mentioned one day that no one ever painted Elvis when he was fat. I painted that for his wedding present in 1989 +/- and it still hangs in his office to this day. So I guess Elvis 2 should have been titled Elvis 3! – pre-PB and Nanner Sandwiches. Denise: Did one particular facial component give you a challenge? What intrigued you while creating this Elvis likeness? Eric: Not Really, maybe the eyes, they are usually most challenging for me because most of the mood and character’s feelings are there. (…intrigued by) his youthful confidence, it was posed but he was looking right at you. I never liked the looking into the distance pose as much as direct eye contact. Denise: You really did capture his eyes and I love the bent tip of his nose. I plan to study his face a bit more having seen your work. Where do you display and sell your portraits other than Fine Art America? Eric: There are 2 Dazbog Coffee Shops; one in Ft. Collins and one in Loveland here in Colorado where several of my originals are hanging. I also have a dozen or so hanging in a pretty upscale bar and grill in Loveland (CO) called the PourHouse. Denise: Do you plan to do more Elvis art? Eric: I don’t have any plans to do another one. That could change. Denise: Have you ever exhibited in an Elvis Art Show? Have you, or would you submit your Elvis art to Graceland’s yearly art contest during “Elvis Week” in Memphis? Eric: No. Didn’t know they existed. I didn’t know about the Graceland thing either. Denise: Have you ever visited Graceland? Eric: Never have. It’s on my ‘to do’ list however. I think that I could spend an entire day there once I ever make it though. Denise: What is your “pay off” for creating Elvis art? What do you get out of it? Eric: Like most of my art I enjoy painting people I admire like John Prine, Tom Waits, James Dean. So essentially the paintings I really get into are a tribute to those people. I have painting requests and topical people but they are not as much fun and I have more difficulty with those. Eric: Thank you and everyone that voted for me!! I;ve known Eric for 30 years and have always known and said he had a unique talent, a unique eye for things, and a unique imagination. It;s about time others get to see it. Congrats. Eric is one of the best portrait artist I have met. He is one of a kind and has the talent to go from one art style to another without any problem. To me, his portraits of Elvis were among the best and I am so happy he is finally gaining the recognition he is entitled to. A very special multitalented man with a great sense of humor. Keep up the good work Eric. As your ex-mother-in-law, I am very happy for you, Eric. I saw Elvis when I was 14 years old at the Tupelo County Fair and, again, took my daughter, Leslie Dee, to see him in 1970 at the Dallas Convention Center. I hope you get to go to Graceland some day. I didn’t make it until 2012 but want to go again. There was so much to see we didn’t make it to the airplane display but plan to go again someday. I would definitely suggest with your great talent that you enter their next contest to paint the amazing Elvis.4 and Good Luck ! !